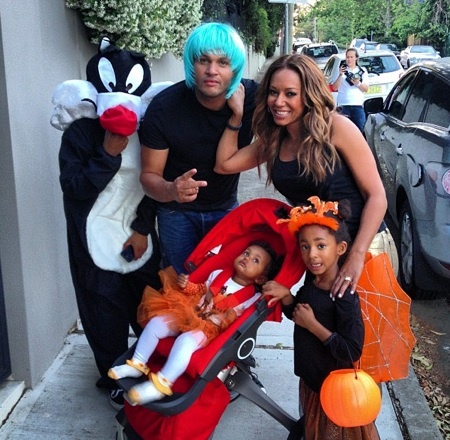 Melanie Brown and her husband Stephen Belafonte took to the streets on Wednesday night to take their girls trick or treating. The singer shared a photo of the family before they headed out and was also photographed later on in the evening. Both Angel and Madison chose the same theme; fairy princess. However, Angel took the look to the next level with a pair of wings and vampire fangs. Stephen showed his spirit by donning a blue wig, while Mel moved through the neighbourhood in a black tank and a pair of gold shimmering pants. The family, who moves between LA and London, has been living in Australia while Mel works on the X Factor. Mel pushed Madison in a Stokke Xplory stroller. Celebrities Share Pictures of Their Little Trick or Treaters!